The 2017 7DAYS EuroCup champion faces a tough road, but one that it has traveled before. The most notable win of Unicaja's season might be its 82-80 overtime decision over UNICS Kazan in Round 4 of the regular season, however, the key win was a 77-78 come-from-behind win at Limoges CSP in Round 4 of the Top 16. Brian Roberts scored 13 of his 20 points in the fourth quarter in which Unicaja trailed 70-67 with less than 3 minutes to go. That's when Kyle Wiltjer hit a three-pointer, which was followed by Roberts scoring 8 points, including a perfect 6-for-6 from the foul line, to put Unicaja in front. Mathias Lessort had 14 points plus 8 rebounds in that win, which turned out to be the victory that eventually qualified the team for the quarterfinals. Kyle Wiltjer is the stretch-four modern teams desire. Tough on defense, and efficient on offense, he is a reliable source at both ends of the floor. Wiltjer has made 56.7% of his two-point shots and is dangerous from long range. No Unicaja player has fired up more triples (75) than Wiltjer this season and his 25 successful threes are tied for the second most on the team. His ability to score from downtown has helped keep defenses honest, opened up lanes for playmakers to penetrate and given big men Giorgi Shermadini and Mathias Lessort more room to operate. 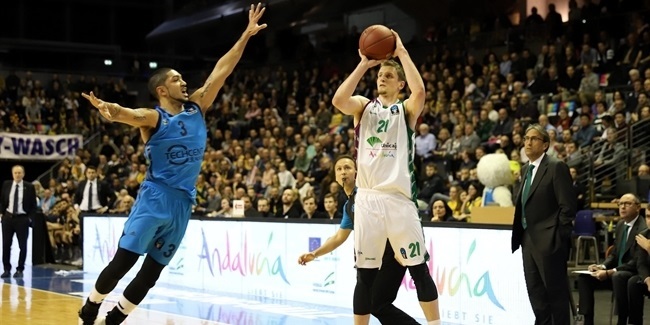 Unicaja enters this quarterfinals series knowing it will need to win at least one game in the German capital to go to the semifinals. With the worst Top 16 record (3-3) and point-difference (-17) of any team in these playoffs, Unicaja will be without home-court advantage in every remaining series it reaches. That should sound pretty familiar. 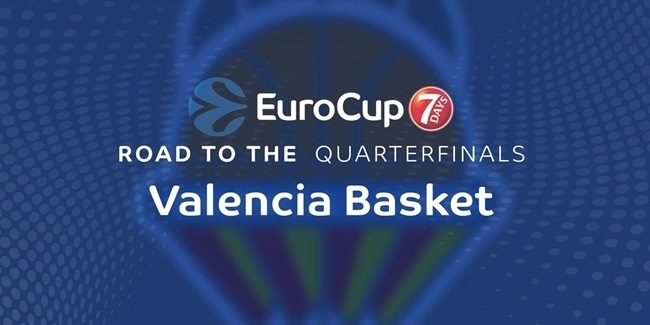 Back in 2017, the only other season Unicaja played in the competition, the team from Malaga was without home-court advantage in the quarterfinals and played against FC Bayern Munich, a German opponent just like this season. Unicaja won the deciding Game 3 to move into the semis. There, again without home-court advantage, Unicaja won Game 1 on the road against Lokomotiv Kuban Krasnodar before completing the sweep in Game 2. Finally, in the EuroCup Finals against Valencia Basket, again without home-court advantage, Unicaja won Game 3 on the road to win the title. 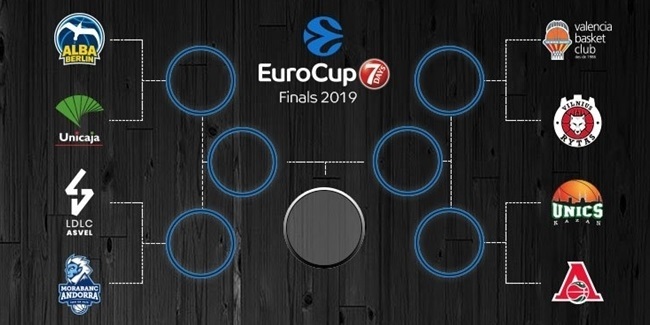 Adam Waczynski, Daniel Diez, Alberto Diaz, Carlos Suarez and Viny Okouo, the EuroCup winners from 2016, will make sure to remind their teammates of it. Unicaja has a two-headed monster with its centers. Mathias Lessort ranked fifth in the Top 16 in average PIR (18.7) and is ranked fifth in blocked shots for the season (1.3 bpg.). He is averaging 10.1 points and 5.3 rebounds and ranks just below fellow center Giorgi Shermadini, who has posted 12.9 points on 73.8% two-point shooting with 5.0 rebounds per night for an average PIR of 16.7. They headline a Unicaja offense that leads the competition with 59.4% two-point shooting, scores the third-most points (86.1 ppg.) and ranks second this season and ninth all-time with its average PIR of 101.8. Being 7-1 at home court with that high-scoring offense and dominant front line, just a bit of road magic can send Unicaja on another deep run.